In the north of Portugal you will find the predominantly granite landscape of the Peneda-Gerês, Portugal’s only national park with about 40 way-marked routes to explore. The routes alternate between rough-paved ancient cart tracks and through ancient hill villages, oak woods and broom landscape. Plus a Celtic hill fort (Citania de Briteiros), a few medieval castles such as Castro Laboreiro, some pleasant towns like Arcos de Valdevez and Ponte da Barca and, not forgetting the delicious wines (Vinho Verde and Douro), which all go to make for a great destination. The postcard image in Amarante highlights the São Gonçalo Bridge on the Tâmega River beside the Renaissance Monastery of the same name. To the east looms the vast granite range of the Serra do Marão – an area of exceptional beauty with many marked routes through coniferous woodland climbing upwards to exposed schist bluffs where golden eagles and peregrine falcons make their nests. In the neighbourhood are Romanesque churches, picturesque mountain villages and cycling and hiking trails to dive into the natural richness of the Tâmega Valley. On arrival at Porto airport, collect your hire car and drive to Caniçada-Gerês (84km, 1 hour), located near to the Peneda-Gerês National Park, one of the most impressive nature reserves in Europe and considered a World Biosphere Reserve by UNESCO. The Pousada do Peneda-Gerês is essentially a mountain chalet, perched high in the mountains between tall forests and spectacular landscapes and with a stunning view over the Cançada Dam and Rio Cávado. Overnight stay at the Pousada Caniçada-Gerês. In the Peneda-Gerês National Park, created in 1971, you will find typical villages that have not changed since the 12th century as well as amazing viewpoints and several waterfalls. Take a walk through ‘Castro Laboreiro’ a village 1000 metres high on a mountain range, where you will discover the history and traditions of its inhabitants. We also suggest you explore the castle ruins where you will see one of the most beautiful views over the Park. Day at Leisure. Park your car near the Spanish border and walk 800 metres to admire the breathtaking views of the ‘Portela do Homem waterfall’ located in Mata da Albergaria. From this point you can do a 20km hike that will take you close to the river and also to the Carris mines, which have been abandoned since the 1970’s. We recommend you take a GPS device with you as there are only a few spots where you can get a phone signal. After breakfast, drive to Amarante (99km, 1 hour 15 minutes) where you will stay at the Casa da Calçada, a beautiful 16th century Manor House with stunning views over the historic town of Amarante and the Tâmega River. The accommodation provides the perfect base from which to explore the Douro and Minho regions of Northern Portugal. Overnight stay at the Casa da Calçada. Drive to Guimarães, also known as the birthplace of Portugal and take a walk through this charming town packed with history and culture. The town is home to what is considered to be the most important Castle (10th century) in Northern Portugal. Take the cable car to ‘Penha Hill’ located on the south-eastern side of the city where you can enjoy the beautiful views overlooking Guimarães before following one of the beautiful hiking routes. If you have time, make a stop at the neighbouring town of Braga to see the city’s major sights including the ‘Bom Jesus church and baroque staircase’. Day at Leisure. Take a walk through “Peso da Régua” taking in the breathtaking views of the Douro River and go follow one of the walking trails or take a scenic train ride to see what this beautiful location has to offer. To complete your trip, do not forget to stop off for a spot of wine tasting. After breakfast, self drive to Porto airport (63km, 45 minutes) for your return flight home. 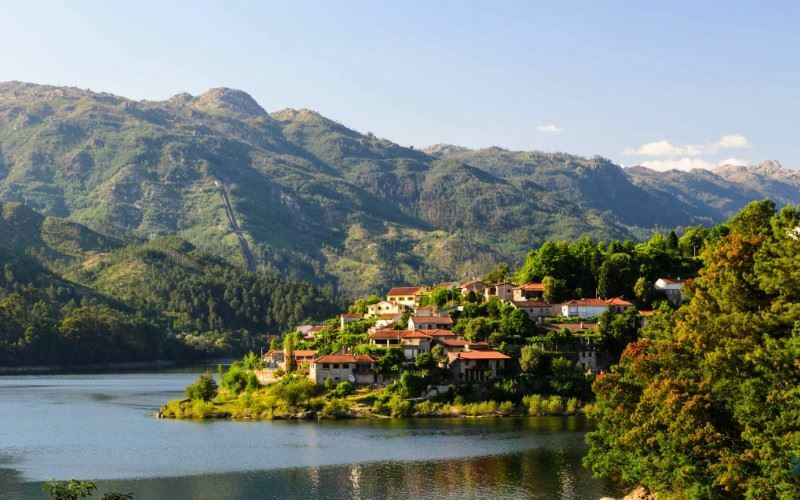 The Pousada de Caniçada-Gerês enjoys an enviable position in the heart of the Peneda-Gerês National Park, one of the most impressive nature reserves in Europe. The Pousada de Caniçada-Gerês enjoys an enviable position in the heart of the Peneda-Gerês National Park, one of the most impressive nature reserves in Europe. Set high in the mountains, the property affords magnificent views over the surrounding hills, the River Cavado and the Caniçada dam. Originally a hunting lodge, the Pousada has maintained many of the building’s original features including wooden beams within the bar and restaurant and a stone fireplace within the lounge. Situated in private, well maintained gardens and enjoying stunning views over the historic town of Amarante and the River Tamega, is the Casa da Calcada. Situated in private, well maintained gardens and enjoying stunning views over the historic town of Amarante and the River Tamega, is the Casa da Calcada. This beautiful 16th century Manor House, once the home of a Portuguese nobleman, has been tastefully restored and furnished to offer guests a high standard of accommodation in a refined setting. Highlights of the property include the sumptuously decorated lounges, the wonderful panoramas and the excellent personal service. The Casa da Calcada also has its own vineyard, the wines of which you can sample at the hotel’s Michelin starred restaurant. A delightful property that is ideal as a peaceful retreat or as a base from which to explore the Douro and Minho regions. 30 air-conditioned rooms including executive rooms, luxury rooms, superior luxury rooms and executive suites.